Smoothies, particularly the ones made with coarse greens such as kale and collards, have a less than smooth consistency. 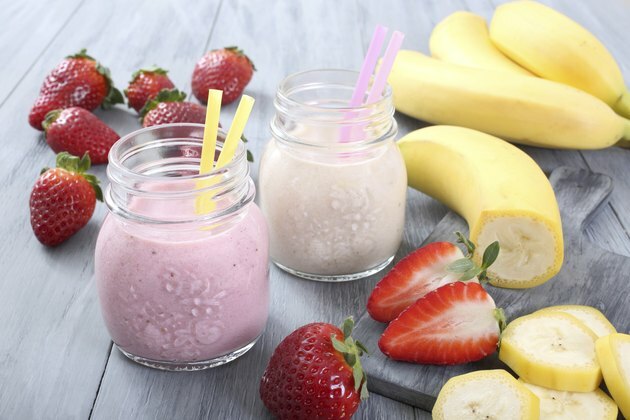 Even when making smoothies with fruit, yogurt and other ingredients, the smoothie may not turn out smooth if it isn't blended long enough or in the proper manner. Understanding what ingredients to use and how to properly blend the smoothie are the keys to achieving a perfectly smooth smoothie. Choose softer greens such as lettuce or spinach to add to a smoothie instead of the coarser greens such as kale. Add fresh fruit instead of frozen fruit to the smoothie, or use more fresh fruit and only a few pieces of frozen fruit. If all you have on hand is frozen fruit, set the fruit out at least 15 minutes; this will allow the fruit to thaw completely. Blend the smoothie ingredients in steps to ensure each ingredient is blended completely before adding the next ingredient. Add the liquid to the blender first, then the fruits or vegetables one at a time. Add ice or frozen fruit to the blender last. Operate the blender on high speed. Run the blender for about one minute, turn it off and scrape any pieces of food from the sides with a rubber spatula. Turn the blender back on and run it in one-minute increments. After each increment, check the consistency of the smoothie and scrape any pieces off of the blender sides. Continue blending the smoothie using this same process until the mixture is smooth.